Behind Tyson Ward (24), Deng Geu (23) and Cam Hunter (22) have formed a strong supporting cast. It is the midway point in the Summit League men’s basketball season, which means a trip to Sioux Falls is only six weeks away. The middle of the season offers a prime opportunity to reassess the field and right the wrongs of a certain someone’s preseason rankings from November. Choosing South Dakota State to take home the title still holds water. Beyond that, the preseason rankings are in need of an overhaul. With eight games remaining for each team, the Summit League is up for the taking. The Jackrabbits are firing on all cylinders once again, throttling the competition in the process. The singular blemish came against Purdue Fort Wayne, but their seven wins have come by an average margin of 22.2 points — including a 42-point waxing of Western Illinois. There is no reason to believe the Jackrabbits are in for a regression, especially if Mike Daum continues his otherworldly level of play. Daum’s 2,803 career points ranks No. 17 all-time, and it isn’t unreasonable to expect him to crack the 3,000-point mark. If so, he’d be one of only nine to accomplish the feat. Daum isn’t alone, either. David Jenkins, Jr. is averaging nearly 20 points per game and is shooting 48.1 percent from the 3-point line, fourth best in the nation. As a team, the Jacks are surgical from downtown, giving them a key edge over the field. Chalk the Mavericks up as the conference’s biggest surprise of the season. After winning merely nine games a year ago, Omaha has already eclipsed that mark and will continue to ascend. The Mavericks bookended six straight conference wins with losses to Oral Roberts and South Dakota State. Still, Omaha is in the driver’s seat for the No. 2 seed. Omaha is averaging 83.8 points per game in Summit League action and shooting 3-pointers at a higher clip than even SDSU. That’s in large measure due to their starting five, one of the Summit League’s most potent. JT Gibson, Mitch Hahn, Zack Jackson, Matt Pile and KJ Robinson are each pouring in north of 10 points per game. Jackson headlines the group, once again ranking among the top-five in scoring. Rounding out the top three scoring teams are the Mastodons. As expected, Kason Harrell and John Konchar have formed an efficient and electrifying pairing. Were it not for Daum, Konchar would be the most talked about player in the Summit League. He ranks third in scoring and second in rebounds to pace the Mastodons. Critical in Purdue Fort Wayne’s rise has been forward Matt Holba. The junior has been a sniper in conference play and averages double-digit points per game. The main hazard for the Mastodons is their reliance on Konchar to stuff the stat sheet. In each of Fort Wayne’s three losses, Konchar has averaged 10 fewer points than in their five wins. If it’s an off night for the program’s all-time leading scorer, the Mastodons will struggle. The Bison entered the season with questions hovering around the program. A solid start to the conference slate has kept the questions at bay, but NDSU will need to sustain their level of play. As anticipated, Tyson Ward is leading the young Bison squad. 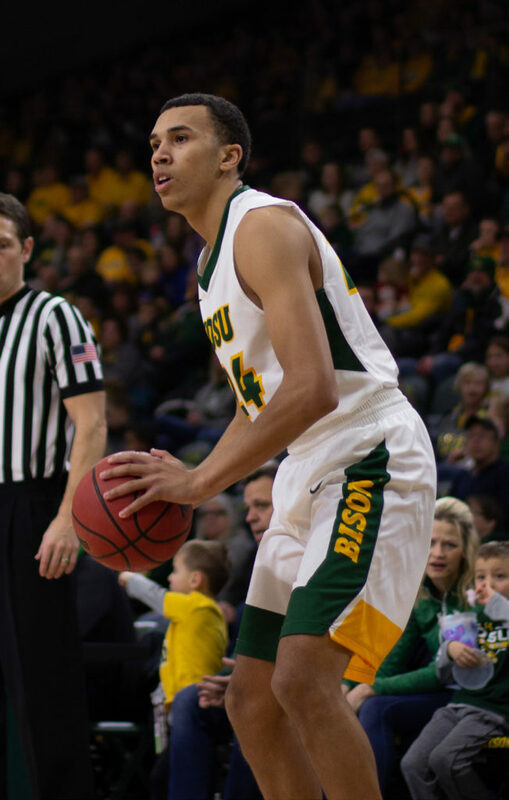 Ward is the Bison’s top scorer and has been a force on the glass. Around him, a steady supporting cast is beginning to coalesce. 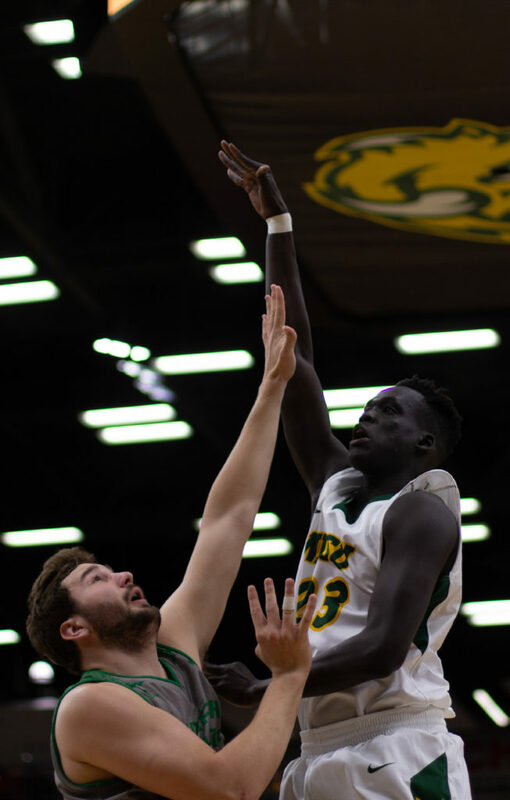 Deng Geu has been a lethal weapon off the bench for NDSU. He, Cam Hunter and Rocky Kreuser have taken large steps forward in elevating their play. Freshman Sam Griesel is fully healthy and looks to be a four-year mainstay in the starting lineup. 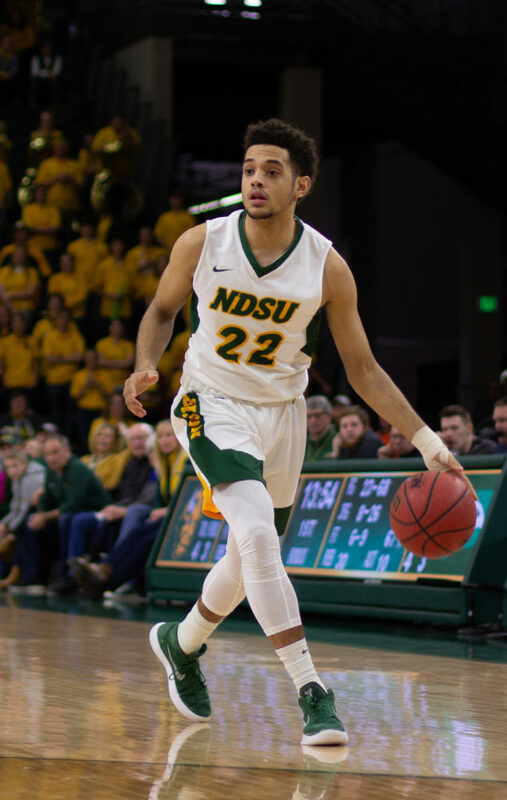 Mix in junior college transfer Vinnie Shahid, and the Bison are coming together. It will be key for the Bison to win the majority of their remaining games. Doing so would enable them to rise in the standings and ideally avoid the Jackrabbits in the tournament. The Golden Eagles opened conference play with three straight wins, but have since lost four of five contests. Big men Emmanuel Nzekwesi and Kevin Obanor have been doing the damage for ORU. A negative scoring margin underscores the issues ailing ORU. In the long term, the Golden Eagles aren’t built to score 80-plus points on a consistent basis. Without being an elite defensive team, it’s a recipe for disaster in the Summit League. The Coyotes have suffered a quick — albeit unsurprising — fall from the top of the conference. The loss of both Matt Mooney and former coach Craig Smith has dramatically altered USD. The Coyotes are still a stingy defensive team, causing headaches for opponents. However, the offense lacks punch outside of Stanley Umude and Triston Simpson. Overall, USD averages the fewest points per game and the worst 3-point shooting percentage. They are a tough out for any opponent, but aren’t a serious threat to the teams above them. The Leathernecks possess a young core, one that looks ready to contend next season. Kobe Webster is the conference’s next star, and he’ll have Isaac Johnson and C.J. Duff back next season. The trio forms WIU’s top scorers. WIU has a 22-point win over the Mastodons to their name, but have not fared well outside of Macomb. The Leathernecks are 2-10 on the road, and looming trips to Fort Wayne, Omaha, Denver and SDSU do not inspire confidence. The Fighting Hawks have had a tough go in their first year in the Summit League. UND has lost eight of their last 10 games, dating back to mid-December. Their only two wins came against cellar-dwellers Denver and Western Illinois. Still, UND could easily be in a very different position. The Fighting Hawks have had to lick their wounds after two narrow losses. The first came against Omaha on a last second missed free throw. In the second, UND had a prime opportunity to stun the Jacks, only to fade late. If Omaha has been the conference’s most pleasant surprise, consider Denver to be the most ugly. The Pioneers were picked third in the preseason poll, but now find themselves on the outside looking in. Joe Rosga, who last year was one of the Summit League’s best scorers, is no longer even the leading scorer on his own team. It’s a key reason the Pioneers are No. 8 in the conference in points per game. Like the Leathernecks, Denver can’t buy a road win. With two trips to the Dakotas and one to Oral Roberts looming, it will be challenging for the Pioneers to crawl back into the race.